To celebrate Bread Baking Day’s one year anniversary, Zorra has chosen bread with sprouts. Technically, soaking the seeds for 12 hours makes them sprouts – you don’t have to see little shoots or roots coming out of the seeds. Many years ago, I routinely used to grow my own sprouts, but graduate school and crazy work hours eventually put an end to that. I’ve been thinking about doing it again, primarily for the health benefits attributed to broccoli sprouts. So, combining a bread with sprouts was a welcome idea! I used a German sourdough rye recipe from Daniel Leader’s book,Local Breads: Sourdough and Whole-Grain Recipes from Europe’s Best Artisan Bakers : Flax, Sesame, and Sunflower Rye (Dreikornbrot). You do need a sourdough rye starter to make this recipe, so check out the book (p. 275), or use a recipe like Breadchick’s (just keep using rye flour to feed the starter, instead of white flour). The only adjustment I made to the original recipe was to double the amount of salt, because I’ve found that Leader’s recipes tend to need a bit more to suit our tastes (and we don’t eat a lot of salt). My dough never really got to the point where it was “firm, smooth, and slightly elastic,” as set forth in the recipe. I ended up having to add almost 3/4 cups more of flour, and my dough was still very wet and sticky. So, based on prior experience, I just stopped, poured it in a bowl, proofed it, and hoped for the best. the proofing, and although it was still sticky, I was able to shape and bake it. The rise was decent (I never get a high rise with a rye bread), and the flavor and crust were out of nutty with great depth of flavor. These are not free-form loaves, so be sure that you have at least two 8 x 4-inch loaf pans on hand. I didn’t, and one loaf, which I baked in a larger pan, was a bit squat, but still delicious! Finally, there is a HUGE typo in the recipe. It calls for 22 cups of water under “volume” measurements, which is incorrect, so I’m giving the measurements in U.S. and metric weights. All seeds should be raw, not toasted. 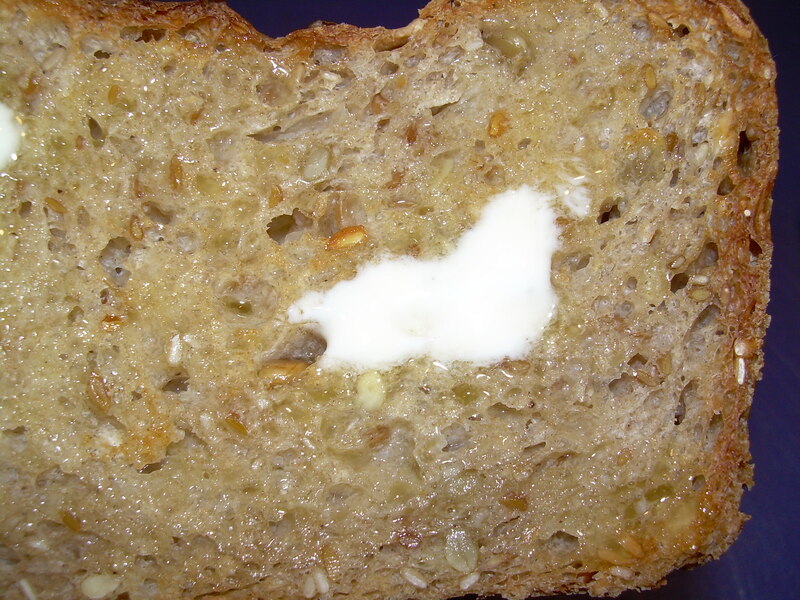 And be sure to check out Susan’s weekly YeastSpotting roundup over at Wild Yeast blog, one of my favorite baking sites! Grease and set aside two 8 x 4-inch loaf pans. 24 hours before you are going to bake, refresh your rye sourdough by feeding it twice within that time period, 12 hours apart. Place the seeds in a bowl, cover with 1/2 cup of the water (6.2 oz./175 gr. ), and soak overnight, uncovered, for about 12 hours. 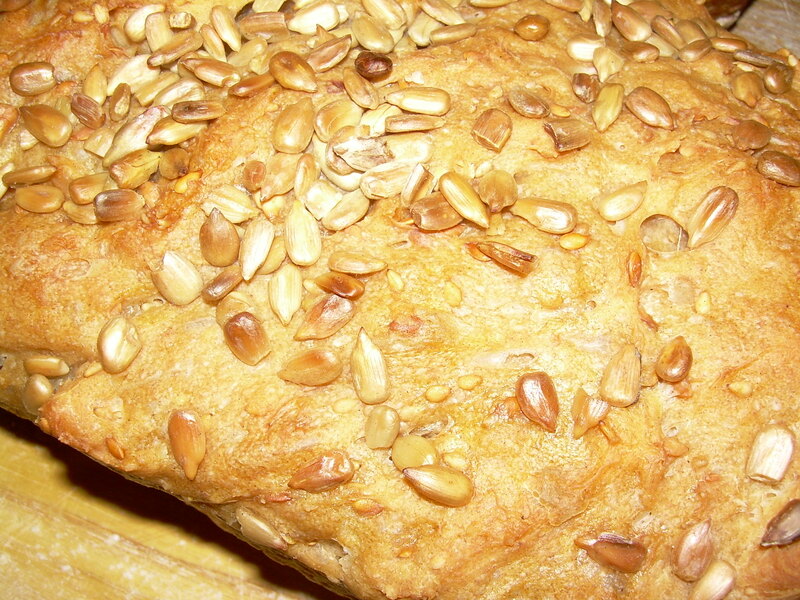 After 12 hours, if you don’t bake, put the soaked seeds in the refrigerator and use them within the next day. Put the remaining water (1.5 cups/12.3 oz./350 gr.) in the bowl of a stand mixer. Using a rubber spatula, stir in the yeast, soaked seeds, bread flour, rye flour, and salt. Stir down the rye sourdough, then measure out 1.8 oz/50 gr. of it and pour it over the dough in the mixing bowl, scraping the measuring cup clean. Work the sourdough into the dough using the spatula, just enough to bind it to the dough. Lightly oil a clear 3 to 4 quart container, and put the dough in it. On the side, using a marker or masking tape, mark the level at which the dough will have doubled. Cover with plastic and let rise until doubled, approximately 2 to 2.5 hours at 70 to 75 degrees F. If your kitchen is hotter than that, check back sooner. Pour the remaining 1/4 cup of sunflower seeds onto a baking sheet. Set it aside, along with a small bowl of water and a pastry brush. Lightly flour the counter. Uncover the dough, scrape it out onto the floured counter, and divide the dough in half, about 17 oz./482 gr. each. Shape each piece of dough into a loaf, and place them, seam side down, into the prepared loaf pans. 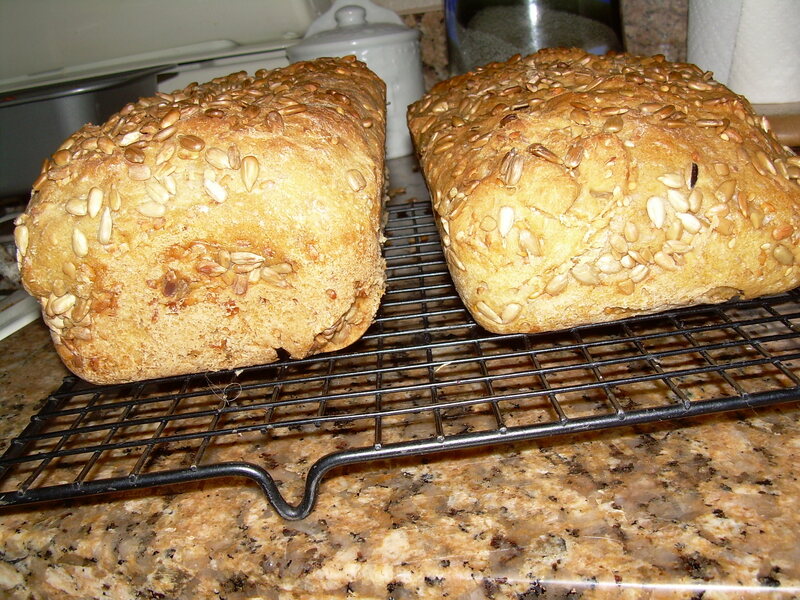 Lightly brush each loaf with water and sprinkle with the sunflower seeds. Cover with plastic wrap, and proof for 1 to 1.5 hours (at 70 to 75 degrees F) until loaves have expanded to 1 to 1.5 times their original size. Preparing the Oven: 20 minutes before baking, preheat the oven to 400 degrees F.
Baking: Place the loaves on the middle rack of the oven, about 35 to 45 minutes, or until the loaves pull away from the sides of the pans and their crusts are deep brown and the sunflower seeds are toasted. Remove loaves from pans when done, and cool for 1 hour before slicing. They’re even better the next day, according to Leader, and I agree! That combination of seeds sounds wonderful! It looks so pretty too. 22 cups of water — ha! There are a lot of “issues” with the formulas in Leader’s book but he does have some fantastic breads and your loaves look really delicious! I love this bread. Is that blueberry jam on there? 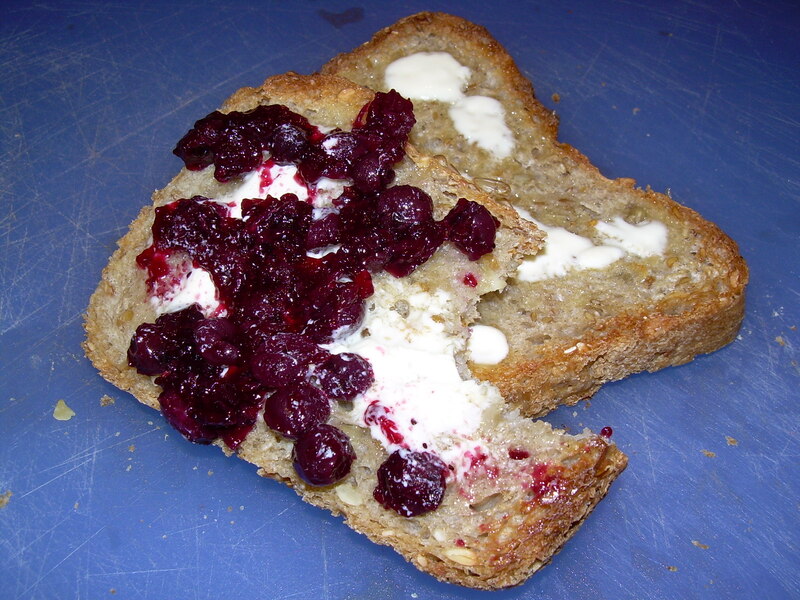 I love blueberrty jam on this bread. Nice choice! Good grief, 22 cups of anything should go bong on a proof reader with any IQ!! Beautiful bread. I tried to sprout four times – I guess I had too many irons in the fire! Looks great… Local Breads is pretty interesting stuff. I keep forgetting to pick it up at the bookstore. Or maybe I’m just broke. Sounds and looks delicious! Well done. So many different seeds in your bread. The texture looks quite good. The bread looks great. I use that book a lot as well. There are a few blunders in it, I have noticed. I like all the seeds you used, what a great combo!